Scouring powder is perfect for cleaning hard surfaces like stove tops, counters, porcelain, fiberglass, and tile. Stop buying bottles of Comet and other cleaners with harsh chemicals and make your own scouring powder at home. This quick trick can make cleaning your house a pleasure (or at least take away the pain of inhaling fumes). Plus, you can do it at just a fraction of the cost! All you need for a basic scouring powder is baking soda, and you can always add scrubbing power or scents as needed. Sprinkle baking soda onto a damp sponge or cloth. Rub it into the surface you wish to clean. Rinse with water, and you're done! Make a paste of baking soda and water. Allow it sit on the stain for a couple of hours before scrubbing. Add one tablespoon of borax to 1/3 cup baking soda and mix well. Pour a little distilled white vinegar on the stain and scrub with baking soda. Grate 1/2 bar of soap and mix with 1 cup baking soda to create a sudsy cleaner. Tip: If you notice a film on the surface after rinsing, use diluted vinegar to do a secondary rinse and wipe it dry. This is a common issue on stainless steel. Baking soda is a mild abrasive and a natural disinfectant. It's tough on stains and germs, but easy on your house. As you learn more about DIY and natural cleaners, you will realize that baking soda and vinegar are two of your most powerful tools! It's inexpensive. Most of the time, you can pick up a box of baking soda for $1 or less. That is significantly cheaper than any store-bought cleaner, and it has so many other uses around the house. Effective sanitizer, stain remover, and deodorizer. Baking soda is an all-in-one tool in your cleaning arsenal. Chlorine-free and safe for use around kids and pets. Even many 'natural' cleaners you can buy have warnings on the label, and that is never a good sign. Safe for most surfaces. Do a test on a small area before cleaning on a new surface. 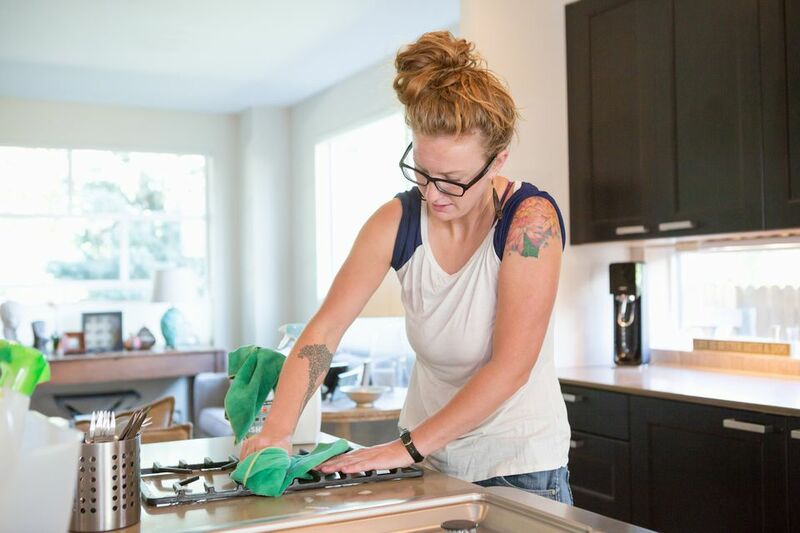 Plastic and the surfaces of some appliances (particularly newer stoves - check the owner's manual) are prone to scratching, even from something as mild as baking soda. Now that you're sold on the cleaning power of baking soda, it's time to add a little pizzazz. While this homemade scouring powder will take care of odor, you can add to its fresh scent with herbs and essential oils. Pulverize dried herbs and add one tablespoon to 1/2 cup baking soda. Old coffee grinders are perfect for grinding herbs. A mortar and pestle work as well. The herbs should be small enough so they won't build up and clog your drain. Add 3 to 8 drops of essential oils to 1/2 cup baking soda and mix well. Feel free to use any combination of scents (in dried or oil form) that you like and switch them up for the season. Maybe lavender and rosemary are best for springtime freshness while cinnamon and clove are better for the holidays and winter months. As an added benefit, many herbs and essential oils have natural antibacterial, antimicrobial and antifungal properties. Tip: Store your finished scouring powder in a clean glass jar with a tight fitting lid and be sure to label it. This also makes a fun (and cheap) gift!